With the introduction of the Sunbelt PL/B Application Server, current Visual PL/B and PL/B:Unix customers can take immediate advantage of the Internet or their local intranet as a new medium of communication to implement thin client technology. The benefits of thin client computing include a reduced cost of ownership and increased flexibility for both the user and the enterprise. However, ease of management and lower cost of deployment are not the big reasons to use thin clients. The principle aim is reduced Total Cost of Ownership that includes not only the up-front cost of hardware, but the much higher prices of installing, securing, supporting, and updating the entire system over time. 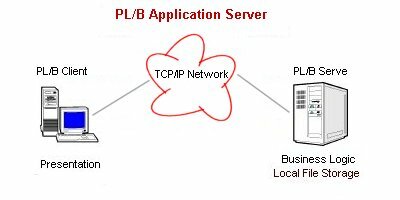 The PL/B Application Server provides a split runtime allowing user interface instruction processing (KEYIN, DISPLAY, PRINT, FORMLOAD, etc.) by the client and the remaining instructions by the server. Programs execute exactly as expected although there are some limitations imposed by the environment. This unique two tier configuration can extended into three tiers by adding the Sunbelt Data Manager. The PL/B Application Engine is deployed and configured on the host server. The host server may be either Windows or Unix based. Either a Windows or Unix server can host both graphical and/or character based applicaions. The application code (programs) should be on this server and data files may also be on this server. The Windows version is supported on Windows Server versions 2003 and later and Windows workstations XP and later. The PL/B Client Interface is installed on each client station. This station can be either a Windows workstation, hand held device running Windows CE up to version 6.5 (or some derivative), Linux, Unix or Apple workstation. The Linux, Unix or Apple workstation usually only delivers character based applications, unless the WINE emulator has been installed on the workstation. The Client Interface can be installed via the Internet. Since its size is small, it takes only a short time to download even on slower dial-up lines. Should an update of the client software ever be required, the server can be configured to automatically upload the software upon connection by the client. The client and host communicate via TCP/IP. Thus, both machines must be configured to support this protocol. Once the Application Engine is installed on the host machine, a small interface program is installed on the client. Upon execution of the Client Interface, a TCP/IP connection is made to the server and the PL/B application begins. All program object code and data remain on the server. Deployment - Since only the small Client Interface is installed remotely, deployment of applications is done on the local server. No PL/B programs or data files are installed remotely and no wasted time traveling to remote sites or worries that the remote site is running an outdated version of the application. To deploy a new application or upgrade, simply copy the files to the server. The Client Interface may be deployed via a simple Internet download. Security - The Client Interface communicates with the Application Engine via the TCP/IP protocol. The server can be configured to limit access to specific remote addresses. Additionally, the communication protocol between the client and the server is encoded and compressed. Also in the case of a LAN, using the Client/Server model means that you do NOT need a network share to the drives where the programs and/or data reside, which further restricts needless access to sensitive data to those that do not need that access. Scalability - The Application Server provides a degree of scalability not seen before. Small remote offices can access corporate data without the need for complicated servers or communication devices, system administrative costs, or additional personnel. The corporation can rest assured that the valuable data is secure and available to authorized users. Large enterprise users can employ additional servers as needed to support new applications or additional users. Programming - The most revolutionary aspect of the PL/B Application Server is that there is little or no programming required to implement the Application Server Solution. Existing programs will execute without even a recompile. Realistically, some thought regarding the deployment of the application in the new environment should be given. Performance - Since no browser technology is employed in this solution, Sunbelt is free to tune both the client and server processes for optimum performance. Communication messages are compressed and intelligently buffered adding to the overall performance. Beyond the operating systems, there is no reliance on external programs. Additional Return on Investment - Most corporations have a tremendous investment in application software. With the Application Server, that investment is preserved while transitioning to thin clients. There is no new language to learn, no files to be ported, and no "new way" of designing your applications. Take a free test drive of this exciting product now. Download the complete product and try it in your environment for thirty days with no obligation. We think you'll be amazed at what the Sunbelt Application Server can do.